We’d love your help. Let us know what’s wrong with this preview of Died in the Wool by Ngaio Marsh. To ask other readers questions about Died in the Wool, please sign up. This was a reread for me, but from a long time ago. The main thing that surprised me was how little this murder mystery evoked New Zealand for me, in spite of the setting on a South Island sheep farm. This was because the majority of the main characters were either British or had strong British links, so this felt like any other early Marsh with people fond of melodramatic utterances. The exceptions were the murder victim herself, who really seemed so much like a female NZ MP. A remarkable characterisation, especially NZ only got their first female MP in 1933 & this title was first published in 1945. & the other was a minor character, the laconic Jack Merrywether. The Kiwi touches in the last third really improved though. I guessed the murderer quite easily & also the one red herring. The Reading the Detectives Group is reading Marsh in the order they were written. I'll rejoin them for Death at the Dolphin at the end of the year. A little Marsh goes a long way with me. Like the previous Roderick Alleyn mystery, “Colour Scheme,” this novel is set in her native New Zealand. Published in 1945, this is also set during wartime, with Alleyn doing extremely secret, counter espionage work in the country. It is never really explained why he should be called to do war work so far from home, but still, this is an interesting mix of crime and spy story. Unusually, the crime in this novel – the murder of Flossie Rubrick – took place in 1942, while Alleyn does not visit her Like the previous Roderick Alleyn mystery, “Colour Scheme,” this novel is set in her native New Zealand. Published in 1945, this is also set during wartime, with Alleyn doing extremely secret, counter espionage work in the country. It is never really explained why he should be called to do war work so far from home, but still, this is an interesting mix of crime and spy story. Unusually, the crime in this novel – the murder of Flossie Rubrick – took place in 1942, while Alleyn does not visit her remote sheep farm until 1943. Living at Mount Moon are various members of staff and servants, plus four young people; a young man, Fabian, carrying out secret work, Captain Douglas Grace, Mrs Rubrick’s nephew, plus two young women; her secretary and her ward. In a way, the murder is something of a side issue, as it is obvious that Alleyn’s purpose is to discover who may be involved in spying on the top secret invention that Fabian Losse is working on. However, it is murder that makes up most of the story. It is clear that just about everybody at Mount Moon has a reason to want Flossie dead and much of the book involves Alleyn interviewing members of the household. As such this is little more than endless interviews, as Alleyn tries to uncover the truth. Like Alleyn himself, I rather missed Fox and Bathgate, and hope the next in the series sees us back on more familiar ground. Died in the Wool (1945) by Ngaio Marsh finds Inspector Alleyn still in New Zealand hunting spies in World War II. Alleyn had already been hard at work in the counter-espionage business in Marsh's previous novel, Colour Scheme. This time he's asked to investigate the death of a member of New Zealand's Parliament--Florence "Flossie" Rubrick. The Rubricks own a large country property which includes sheep herds and wool processing quarters. She had gone missing one evening after announcing she was h Died in the Wool (1945) by Ngaio Marsh finds Inspector Alleyn still in New Zealand hunting spies in World War II. Alleyn had already been hard at work in the counter-espionage business in Marsh's previous novel, Colour Scheme. This time he's asked to investigate the death of a member of New Zealand's Parliament--Florence "Flossie" Rubrick. The Rubricks own a large country property which includes sheep herds and wool processing quarters. She had gone missing one evening after announcing she was headed to the wool shed to practice an up-coming speech. It isn't until sometime later that her body is found packed into a bundle of wool that has been sold. Her nephew, Douglas Grace, fears that a spy is at work on the farm. He and Fabian Losse (nephew to Flossie's husband Arthur) have been working on a top-secret, hush-hush gadget that will greatly aid the war efforts and Grace is certain that Flossie must have discovered proof of the spy's identity and been killed because of it. Losse doesn't believe in the spy theory, but he does want the murder solved and after the local police flounder for over a year he writes to the "big wigs" and asks for Alleyn to drop in...dangling the possibility of a spy in front him as justification. Since the case is so cold (no clues lying helpfully about to be picked up), Alleyn spends most of his time listening to every member of the household's account of the night in question and their impressions of Flossie. Arthur is no longer around--he died shortly after Flossie disappeared--but the two nephews, Flossie's ward Ursula Harme, and Terence Lynne, Flossie's secretary all give Alleyn their version of events. It isn't long before Alleyn realizes that there are several currents of motive running beneath the surface. There's a local boy who was Flossie's favorite until they had a grand row. And there's the growing affection between Terry (Terence) and her employer's husband. Not to mention the sudden fall from favor that Douglas experience with his aunt. A late-night hunt in the wool shed (yes--even all this time later) is called for and Alleyn becomes the target for the murderer himself before the curtain falls on this one. What is particularly nice about this one is the way Alleyn's interviews so clearly underline that no one is the same person to each person they interact with. Every member of the household produces a different Flossie for the Inspector to understand. Marsh uses the psychology of each person's version to help Alleyn to understand what Flossie did in the days leading up to her murder that made her death imperative for the killer. Some may find this a bit slow going--there's a lot of talk and little action until the last third or so of the book--but in this instance I think it works. A good closed group mystery with excellent setting and background. ★★★ and 1/2. 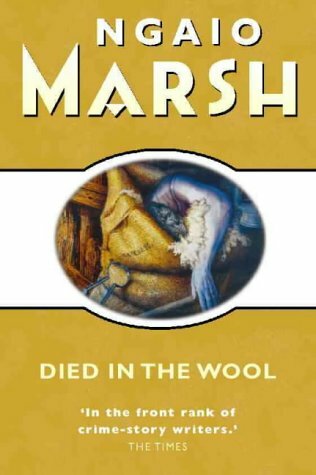 Died in the Wool is one of four Alleyn tales Marsh set in her native New Zealand, and is made even more interesting as it was actually published during the Second World War, and incorporates aspects, issues, and perspectives on the war climate into the murder mystery plotline. Being written before Marsh would have even known when or how the war would end, some of the settings and characterisations can give insights into New Zealand at that time that no recently written historical novel, no matte Died in the Wool is one of four Alleyn tales Marsh set in her native New Zealand, and is made even more interesting as it was actually published during the Second World War, and incorporates aspects, issues, and perspectives on the war climate into the murder mystery plotline. Being written before Marsh would have even known when or how the war would end, some of the settings and characterisations can give insights into New Zealand at that time that no recently written historical novel, no matter how well researched, can match. One summer evening in 1942, formidable Member of Parliament Florence “Flossie” Rubrick goes to the wool shed on her high country property to rehearse a patriotic speech, and disappears. Three weeks later, she’s found – dead inside a bale of wool at an auction. Inspector Alleyn, in New Zealand on war security matters, comes to the high country sheep station more than a year later, after Rubrick’s husband has also passed away from illness, and tries to piece together what really happened to the polarising MP, based on the testimonies of several acquaintances. At the same time, concerns are raised about the top-secret security work being carried out by two young men – have the blueprints for the new anti-aircraft device been leaked? In effect, Marsh has transported the classic British ‘country house’ murder mystery, with its closed environment and small amount of characters – all of whom have a motive for killing the victim, into a rural New Zealand setting during the war. But she also does a few things differently that help Died in the Wool stand out. Alleyn arrives months after the murder, so can’t rely on the crime scene clues and observations usually available to detectives – instead he has to weigh the differing recollections of the residents (each has its own chapter, eg “According to Terence Lynne”). This device gave Marsh not only a different structure and investigative method, but the opportunity to ‘voice’ varying views and concerns about what was going on during the war, through her different characters. In general, Marsh’s plots weren’t quite as intricate as Christie’s puzzles, but she was the superior writer when it came to setting, description, and giving her characters more depth and layers. Compared to today’s crime novels, the pace is somewhat languid, and at times, the language used dates the book, but decades after it was published, Died in the Wool remains an absorbing, enjoyable read. New Zealand is the site of all the action, a very well known lady shows up dead rolled up in wool at her sheep farm even though she'd had a house full of guests who were helping her look for a diamond clip along the paths surrounding the estate. Alleyn is called in to thoroughly investigate how this came about and who was responsible as he is UK's man on the scene in New Zealand on the watch for spies. It is wartime. There are some interesting characters, as usual, but the dialogue is cliche and the pace is very sluggish. Another solid Marsh mystery. I was able to guess the killer towards the end, but there were plenty of suspects to choose from. She also offered up a unique landscape that is was part English countryside, part new Zealand wilderness. My previous experience with GA mysteries had solely been from the Christie canon, so it has been refreshing to get another perspective and writing style. Many times a bit outlandish and over the top, but almost always fun. I do like Inspector Alleyn, and enjoyed the descriptions of the vast landscapes of New Zealand’s South Island in this mystery thriller set in 1942. Alleyn is far from his usual supporting cast in NZ during WWII, sussing out espionage after the body of a female MP is found in the middle of a bale of wool. Alleyn visits the sheep station where the murder occurred to try and solve the case, but also learn if secret weapons research being carried out there is being leaked to the enemy. I’ve not read t I do like Inspector Alleyn, and enjoyed the descriptions of the vast landscapes of New Zealand’s South Island in this mystery thriller set in 1942. The action takes place in New Zealand in the war so a classic murder story is set away from a British location with the addition of espionage to add to the interest . The author writes well as she should about her home country and draws the characters interestingly and differently from what might be expected in a classic murder mystery. It’s thoroughly enjoyable with plenty of twists and turns so the murderer only becomes guessable towards the end. One and a half stars for this unfortunately talky-talky wartime mystery. Excellent basic idea--rich grazier's wife vanishes, only to turn up weeks later well past her use-by date--but the book was done to death under an avalanche of words, words, words. Any action is crammed unceremoniously into the last quarter of the book. We start with Alleyn being sent up to the holding as a member of some unnamed wartime special branch, supposedly too hush-hush to even mention but it just reinforces the weak One and a half stars for this unfortunately talky-talky wartime mystery. Excellent basic idea--rich grazier's wife vanishes, only to turn up weeks later well past her use-by date--but the book was done to death under an avalanche of words, words, words. Any action is crammed unceremoniously into the last quarter of the book. We start with Alleyn being sent up to the holding as a member of some unnamed wartime special branch, supposedly too hush-hush to even mention but it just reinforces the weakness of the structure. His interview with the suspects turns into a far too longwinded (not to mention unbelievable) group therapy session, with shellshocked soldiers, state secrets, young women whose upper lips are so stiff they can act as corsets for their heaving...emotions, schoolboys who run away to join up, etc etc dreary etc. until oh yes--the mention of spies among us sets everyone on edge. Marsh continues to be obsessed with people's hands; at one point she describes the butler as standing with his hands at his sides, and "turned outward from the wrists." I've tried that position as well--this time it's physically impossible, at least for normal people. Her editor let her down too; at one point, for example, she tells us that "the habit was habitual with him." Well, it would be. Add to this that the killer was predictable from the outset and the ending was ALSO pure tell-not-show (epistolary ending, no less!) and you have the reason I shelved this as "stonking great disappointment." Marsh's penchant for dividing each chapter into several numbered parts, as if it were a TV drama with commercial cues at all tense points (though yes I know TV hadn't taken off yet, that's how it felt) did not help matters. I find I really like the New Zealand ones in this series. This one is also set in NZ, during WWII. Alleyn's essentially counter-intelligence, investigating a potential information leak (and associated murder) on a New Zealand sheep farm. I like the reduced cast of characters. I like the setting. And it struck me in this one that I definitely have a better sense of Alleyn as a character now. One could argue that 13 books in is too late - I don't disagree. I will only say that it probably happened a I find I really like the New Zealand ones in this series. This one is also set in NZ, during WWII. I like the reduced cast of characters. I like the setting. And it struck me in this one that I definitely have a better sense of Alleyn as a character now. One could argue that 13 books in is too late - I don't disagree. I will only say that it probably happened a few books ago, and I didn't notice until now, but I definitely have a better sense than in the early novels. Also, no case of insta-love. There is an engaged couple, but they've known each other for a year or so, so y'know, fair. Detective Chief Inspector Roderick Alleyn, in New Zealand during World War II to track down spies, both from outside and from within, travels to the countryside where ranchers keep sheep to investigate a year-old murder and potential espionage in Ngaio Marsh's Died in the Wool. Flossy Rubrick, a member of the New Zealand Parliament, disappeared a year earlier, only to be found rolled up in a bale of hay five weeks later. So the four people who live at her and her late husband Arthur's home in Mo Detective Chief Inspector Roderick Alleyn, in New Zealand during World War II to track down spies, both from outside and from within, travels to the countryside where ranchers keep sheep to investigate a year-old murder and potential espionage in Ngaio Marsh's Died in the Wool. Flossy Rubrick, a member of the New Zealand Parliament, disappeared a year earlier, only to be found rolled up in a bale of hay five weeks later. So the four people who live at her and her late husband Arthur's home in Mount Moon host Alleyn after a year of little success at locating the murderer. Alleyn does not serve in his regular role as homicide detective during the war. However, he takes this job because the two young men, Fabian Losse and Douglas Grace, both invalided out of the army, have been working on a top secret device for the military and have had concerns over espionage. While I liked the New Zealand setting, this entry in the Inspector Alleyn series was not one of Marsh's better efforts. Not one of my favourite Inspector Alleyn whodunnits. A nice New Zealand high country setting, and an inventive murder, but Alleyn, arriving long after the event, and concerned with war-time treason as well as murder, has to recover past events by a round-table recounting of the past by the inhabitants of the farm estate. Rather static. No Troy, no Inspector Fox. One summer evening in 1942, Flossie Rubrick, goes to her husband's wool shed to rehearse a patriotic speech - and disappears. T Not one of my favourite Inspector Alleyn whodunnits. A nice New Zealand high country setting, and an inventive murder, but Alleyn, arriving long after the event, and concerned with war-time treason as well as murder, has to recover past events by a round-table recounting of the past by the inhabitants of the farm estate. Rather static. No Troy, no Inspector Fox. First half almost unbearably talky. Second half picked up. Like the previous installment set in New Zealand, interesting for the setting, but I miss London and Inspector Fox as much as Alleyn does. May the war be over soon and Alleyn back to his usual haunts. Has the most insidious manner of hiding the body of any mystery I've ever read. I'm pretty sure this is my first Roderick Alleyn, so perhaps not the right place to start! but, it actually functions just fine as a standalone, since it seems like the characters I would otherwise be expected to be familiar with are not present in this mystery (aside from Alleyn), which is set in New Zealand. it's fascinating that this was written during the war, with Marsh not knowing how it would all end. the way the victim's body was hidden seemed exceptionally gruesome for some reason. Like "Colour Scheme," this book is set in wartime New Zealand, and while I give it the same rating as its immediate Marsh predecessor, this seems a better book. The story takes place on an isolated South Island sheep station, apparently near Canterbury (though the book never makes the location clear). It's the third of four Alleyn mysteries set in New Zealand (though "Surfeit of Lampreys" is also partially set there), with the last one not coming until 1980. It's just a good story. Marsh has by n Like "Colour Scheme," this book is set in wartime New Zealand, and while I give it the same rating as its immediate Marsh predecessor, this seems a better book. The story takes place on an isolated South Island sheep station, apparently near Canterbury (though the book never makes the location clear). It's the third of four Alleyn mysteries set in New Zealand (though "Surfeit of Lampreys" is also partially set there), with the last one not coming until 1980. It's just a good story. Marsh has by now developed as a writer, so that her characters do not seem to be similar to those in previous books. Flossie Rubrick, mostly in absentia, is the protagonist, and a wonderful character. But several others are also well-crafted, especially Fabian Losse and the teen-aged Cliff Johns. And we have a new Inspector Alleyn here, less fey and effete, essentially all-business and devoid of eccentricity. Because this takes place in New Zealand, he is missing his usual team (especially "Br'er Fox"), so one loses the engaging by-play usually seen with his normal group. For the first time, I did guess "who did it." though I was hardly sure until the book confirmed it. The plot is a little less ornate and confusing than in previous books, though once again it would have benefited from a map of the sheep station (it has quite a few buildings), and perhaps a diagram of the shearing building. A bonus here is a picture of everyday New Zealanders during World War II, and life on a sheep station. Electricity had essentially not arrived, the phone was a party-line, and the nearest neighbors are generally several miles away. It takes several hours to get a doctor. There are bits of interplay between what is British and what is Kiwi, which are fun. Loved it. This was my first ever Ngaio Marsh, read as part of the Ngaio Marsh challenge January choice for 2019 for Reading the Detectives Group. I feel excited to enjoy an author as freshly and as much as I did when I read ‘Death on the Nile’ by Agatha Christie at age 13. The style of this book is very different and I had an audio edition which while being narrated beautifully by James Saxon, I struggled with the time gaps in several places at the beginning of the novel and had to rewind to wor Loved it. This was my first ever Ngaio Marsh, read as part of the Ngaio Marsh challenge January choice for 2019 for Reading the Detectives Group. I feel excited to enjoy an author as freshly and as much as I did when I read ‘Death on the Nile’ by Agatha Christie at age 13. The style of this book is very different and I had an audio edition which while being narrated beautifully by James Saxon, I struggled with the time gaps in several places at the beginning of the novel and had to rewind to work out what happened in which year. I will try to obtain a printed copy for my next group read, but I really did enjoy lying back and having the story read to me, especially as a lot of the plot was unfolded during character dialogue, which I think some others in the group struggled to sort out in print. #13 in the suave and debonair, Scotland Yard Superintendent Roderick Alleyn mystery series. Alleyn is detached, sophisticated and expensively educated. WWII New Zealand where Allyen is helping the government investigate possible espionage. Summer,1942, Flossie Rubrick disappears. Three weeks later she is found packed inside one of her own bales of wool. A year later, Allyen goes to the remote sheep ranch to investigate the murder and possible case of espionage regarding two men working on a top- #13 in the suave and debonair, Scotland Yard Superintendent Roderick Alleyn mystery series. Alleyn is detached, sophisticated and expensively educated. WWII New Zealand where Allyen is helping the government investigate possible espionage. Summer,1942, Flossie Rubrick disappears. Three weeks later she is found packed inside one of her own bales of wool. A year later, Allyen goes to the remote sheep ranch to investigate the murder and possible case of espionage regarding two men working on a top-secret device for the military. Now this one is more like it! It features Mr. Alleyn from the beginning. It's still set in NZ and features both a murder and his war work of dealing with the Nazis, and seems most appropriate to read during our current political climate. The people are well drawn and complex, and the murderer hard to figure out. There's a good bit of psychology in it, and it is well thought out. The hardest thing about listening to this one is that it features someone with a head wound, and I'm home listening to Now this one is more like it! It features Mr. Alleyn from the beginning. It's still set in NZ and features both a murder and his war work of dealing with the Nazis, and seems most appropriate to read during our current political climate. The people are well drawn and complex, and the murderer hard to figure out. There's a good bit of psychology in it, and it is well thought out. I really liked this Inspector Alleyn story, even sans his usual crew. He was not in his usual police role since he was tasked with ferreting out a 'spanner in the works' in the guise of a war enemy/traitor giving away secrets to the Nazis. However, in the process, he solved a 15 month old muder. It was a riveting tale, complete with additional insight into Alleyn's character. And he really likes his wife, which appealed to me. So much better than the prior in the series. Alleyn is still in New Zealand and this time investigates an unsolved murder on a sheep ranch. Excellent setting, pleasant family, and an interesting plot. The characters' different opinions of the murdered woman were presented reasonably naturally and I felt I knew her, and her deceased husband, quite well. A satisfying read. The writing is so delightfully witty that I think I missed a good portion of it by listening to the audiobook. The book, strangely, is 90% dialogue, like a play, which makes it a bit slow at times (no action, only re-telling) but the characters are great and the British cleverness is on point. Would read another in the series, but not listen. Repeat listen. A good kiwi based mystery. I really like the love, liking, and, respect Roderick has for his wife Troy. I think the way Ngaio Marsh ends the story lets the rest of the book down, not sure how else she could have done it though without adding a few more chapters to the end. Extra: some 'grandpa' generation cursing, emotional adultery. Of all the "Great Ladies" of the English mystery's golden age, including Margery Allingham, Agatha Christie, and Dorothy L. Sayers, Ngaio Marsh Dame Ngaio Marsh, born Edith Ngaio Marsh, was a New Zealand crime writer and theatre director. There is some uncertainty over her birth date as her father neglected to register her birth until 1900, but she was born in the city of Christchurch, New Zealand.